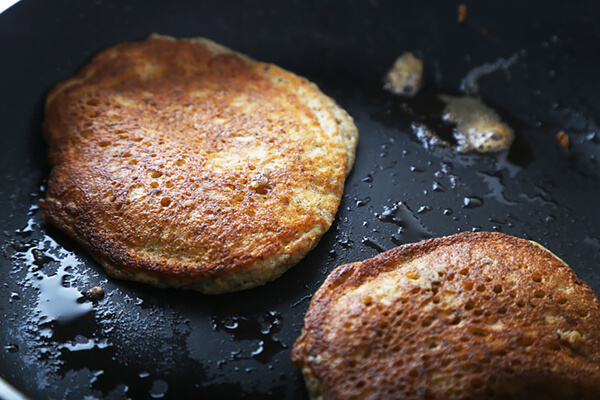 A long time ago, I used to eat steel cut oat pancakes. I used to adore them, the chunky consistency, the full body taste, and the chewy texture. While these aren’t as chunky, they came pretty damn close with the satisfaction. I don’t like those protein pancakes or those cream cheese pancakes that turn out more like crepes. 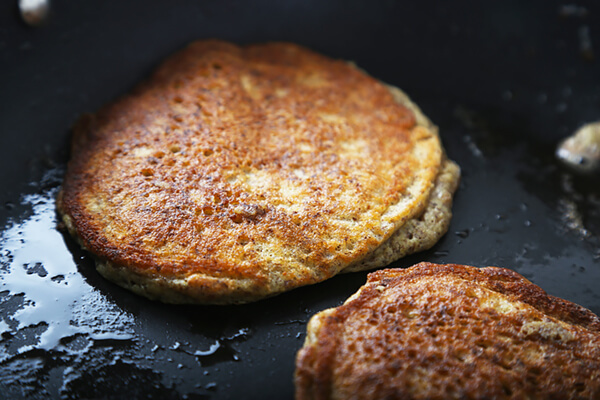 I want a PANCAKE and there’s not all that much you can do to actually get what you wish on keto. I sought out an adventure and wanted to figure out a way to get a very low carb version of the breakfast I missed. I came out with something that exceeded my expectations in every way. A bit fluffy, a bit heavy, all taste, and extremely filling. 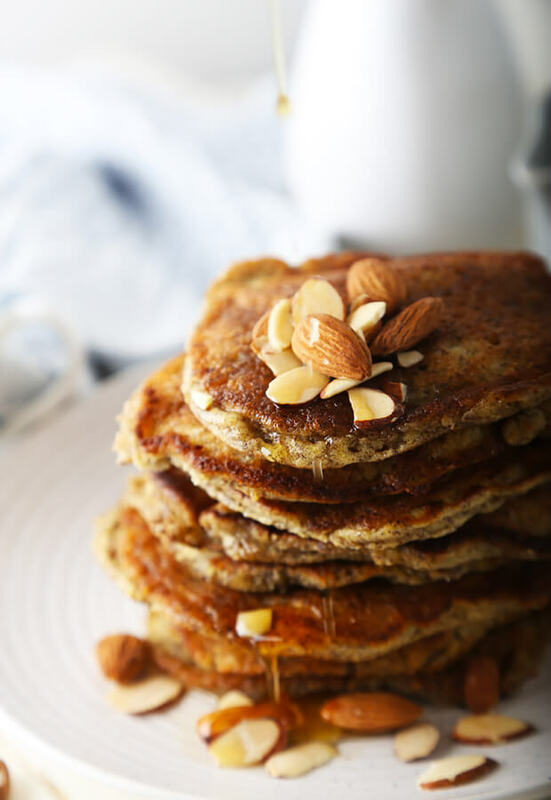 Top this with a knob of butter and some Mrs. Butterworth’s Maple Syrup (or Torani syrup if you have that available) and you are in for a decadent breakfast. You see that stack of 5 in the picture? I actually only stacked the 5 up for the picture, but as I was photographing I said screw it. I ate them all and I don’t regret a single second of it. They’re DELICIOUS. My list of ingredients come from different sources. 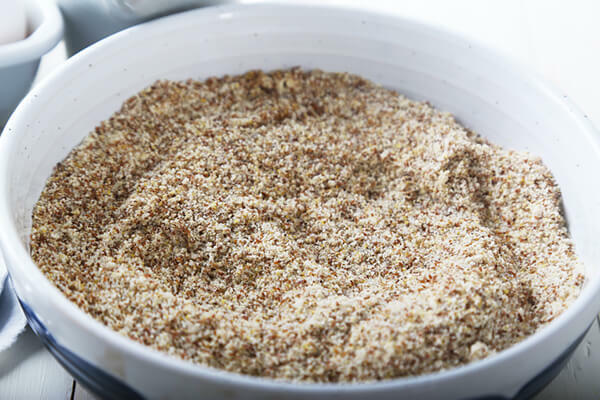 For the Flax Seed Meal, I am using Bob’s Red Mill. For the Almond Flour, I am using Honeyville. The reason I don’t use Bob’s Red Mill Almond Flour is because the texture is much grainier and just doesn’t cook as well as the Honeyville. If you’re not a fan of coconut oil, try expeller pressed coconut oil. When they use an expeller press, it gets rid of the coconut flavor. It’s much cheaper than MCT oil, and it is around 73% MCT in itself. I used to not like it but now I love the accent flavors it can bring to things, especially fried things. Keep on ketoing on and as you know I’d love to hear from you in the comments below! Best of luck in 2014 with the health/weight loss transitions and goals! 1. 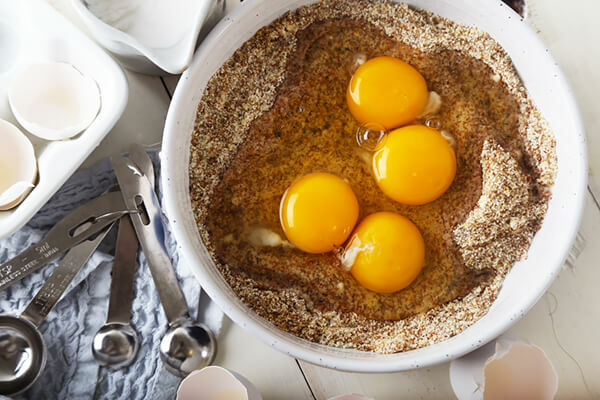 In a mixing bowl, add your almond flour, flax seed, erythritol, salt, and baking powder. 2. 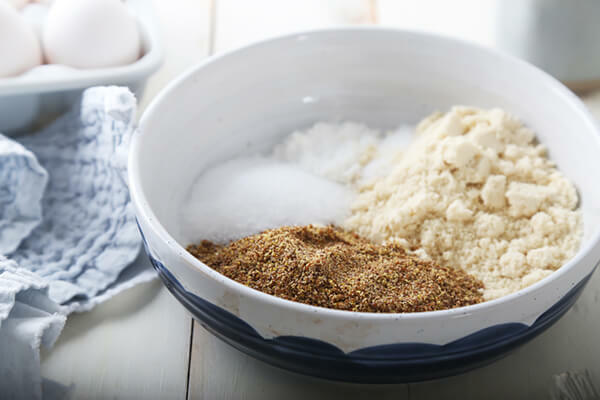 Mix the dry ingredients together well so everything is distributed evenly. 3. Add your 4 eggs to the mixture. 4. Mix everything together until a liquid consistency is achieved. 5. Add in 4 tablespoons coconut oil and the coconut milk. Mix it together well until it’s a slightly more liquid consistency. 5. Add your coconut flour and mix well. 6. 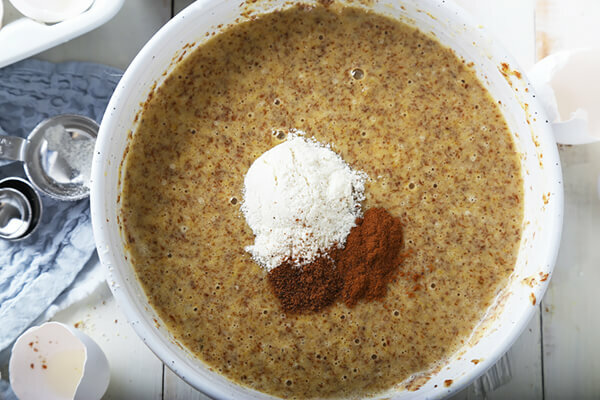 Add your spices to the mixture and mix them in well until they are distributed in the pancake batter. 7. In a skillet, heat up 2 Tbsp. Butter and 1 Tbsp. Coconut Oil. Wait until the butter starts to bubble well and is starting to turn brown. 8. Add 1/4 Cup of pancake mix at a time. Try to only cook 2 at a time. When I cooked 3, they did not cook as evenly as I’d have liked. 9. When the top starts to bubble, you know that side is ready. Flip it over with a spatula. 10. Cook on the other side until it’s browned and doesn’t fall apart. 11. Remove from the pan and enjoy! 12. Optional: I added sugar-free Mrs. Butterworth’s Maple Syrup to these with a knob of butter on the top. They were absolutely fantastic. 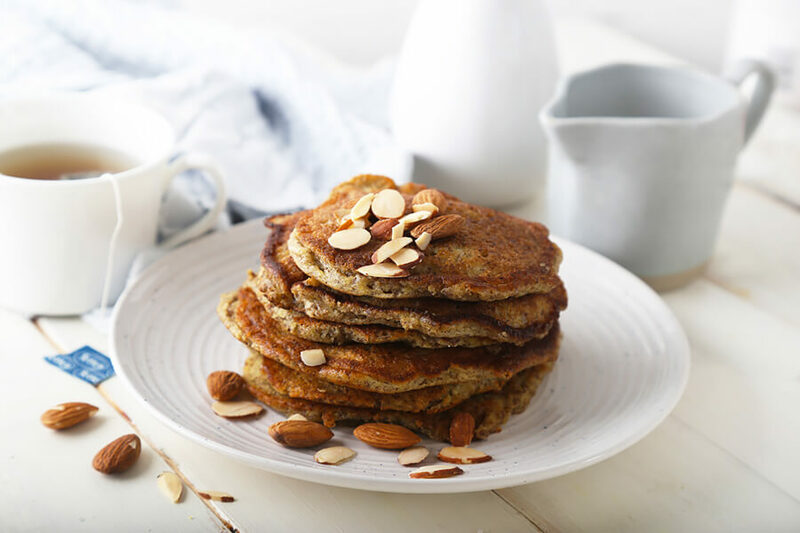 This makes a total of 8 servings of Almond Flour & Flax Seed Pancakes. Each serving comes out to be 225.5 Calories, 20.42g Fats, 2.05g Net Carbs, and 6.43g Protein. Mix in the wet ingredients, trying to get as consistent of a texture as possible. 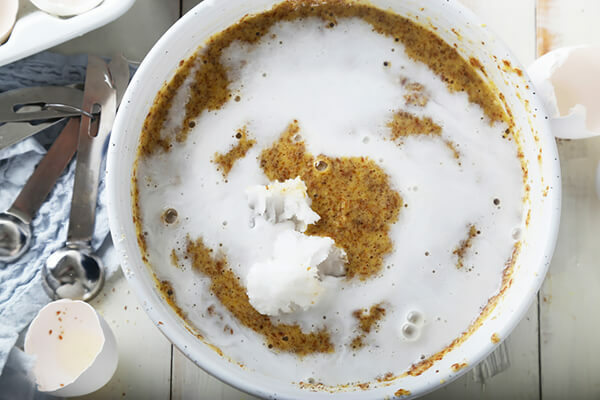 In a pan, heat butter and coconut oil to medium-high heat. Add 1/4 Cup batter into the pan and turn the stove to medium-low heat. Once they bubble on top, let them site for a minute more to fully cook on the bottom (they are a little wet on the top). Flip them after they're set on the bottom and sides. 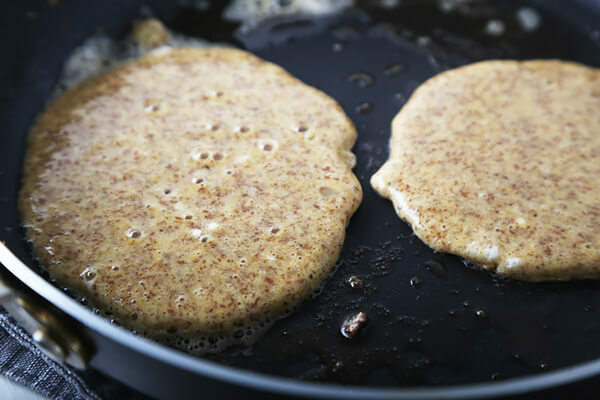 Cook through on the other side and serve with butter and sugar free/homemade low carb maple syrup.